Stage three of this year's tour deserves a mention. Not only because it will involve the possibility to get a sighting of cobbles, but in addition to this, the finish can arguably be described as similar to the Amstel Gold Race. Two classics in one, that must be worth a mention, don't you think? The race returns to France and departs the city of Orchies, a city well known to the riders competing in Paris-Roubaix. The fact that this edition of the tour contains a few kilometres of cobbles frighten some while others see this a blessing and a possibility. Remember the havoc back in 2010? Personally I welcome cobbles, I believe any tour is more than cols and climbing, the tour winner should be able to perform over any surface. Perhaps a bit old-fashioned and romantic, I know, but that's how I feel. Handling cobbles could be crucial not only to win stages but also to not loose the tour. The team leaders whip their team mates hard to stay near the front, and we all know the difficulties that can present. However, the surface of today's stage will be rather smooth, as Prudhomme for some reason has exluded the bigger cobbles this year. Next year then. 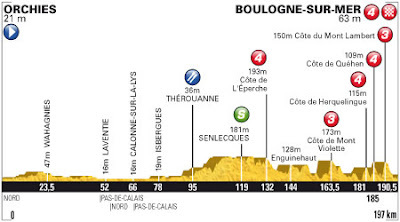 As mentioned, some think of the finish in Amstel when they see the finish in Boulogne-sur-Mer. The finish is what makes this stage similar to a classic. The tour returns to Boulogne-sur-Mer for a forth time, last in 2001. 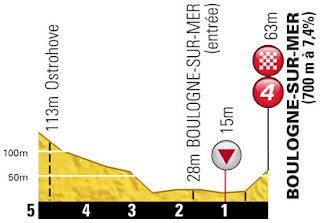 There are six pretty tough climbs, whereas four of them in the last 16 kilometres of the stage. Be aware of the wind as the tour sweeps by the English Channel. Cross winds can easily split the peloton. No one should exclude Sagan, as he showed great form so far in the tour, he climbs well and has a finish anyone envy. Edvald Boasson Hagen is the man Sky will ride for tomorrow, based on the show the last days, perhaps it's more fair to say "that guy who's not riding for Brad-day". Good news is that not many teams will have that many riders strong enough to cope with the climbs so not much support will be there for anyone. Chavanel won the French championship on similar grounds a mere year ago, while Cancellara has shown his strength before, while Goss is getting closer by the days. A punchy rider like Gilbert or Valverde could also bring the stage home. Bring on the classic stage. Sources: Letour.fr and "Røff guide til Tour de France 2012" - book by Johan Kaggestad, famous Norwegian commentator and coach.